Our last article on m-commerce looked at the effect of performance on conversions for e-retailers. In this second part, we take a look at how user context is used to optimise and adapt content by major e-retailers, and how this can affect conversions. For a deeper look at the cases to be made for server-side and adaptive content delivery depending on device and context see these articles. All of these differences will feed into considerations about adapting both content and layout depending on how a user interacts with a given device. Below, we run through a selection of m-commerce organisations that have made the decision that the mobile context is different enough to the desktop one to make a variety of content and layout changes for their mobile sites. Many of these examples can be found in the Google Mobile Playbook mentioned above – for their take on these sites in that book, click here. 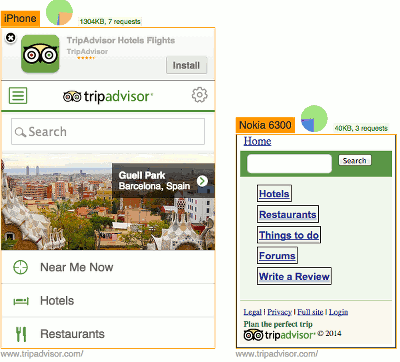 The priority hierarchy of the Tripadvisor m-commerce site is quite different to that of the desktop site. After ‘Search’, ‘Near Me Now’ is given top billing, and uses location information to serve up restaurants, hotels and attractions nearby, as well as a list of ‘Best Nearby’. By contrast, the company’s understanding of the different mobile and desktop user contexts is highlighted on the desktop site with top billing given to ‘Plan your perfect trip’, followed by lists of top destinations, beaches etc. 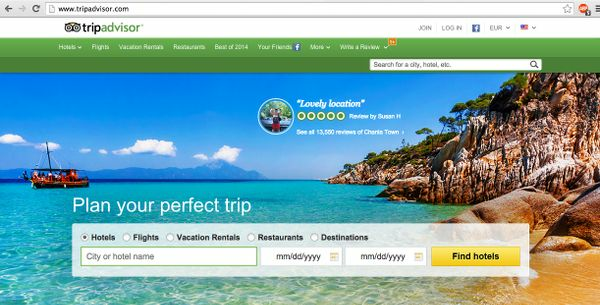 Tripadvisor.com is geared toward planning and browsing, while the mobile site privileges intent to act in the current moment and aims to make the execution of that action as painless as possible. In an indication of just how much can be done with device specific optimisation, the site also works well even on much lower-end phones. On the Nokia 6300, a minimal, but still functional website is rendered, showing users the input forms and links they need on a super-light page (40KB). Note how features, such as ‘Near Me Now’ have been stripped out of the page served to the Nokia; since the 6300 doesn’t have GPS, Tripadvisor has made the decision not to include a function users can’t use. Note also how much lighter the Nokia page is – 40KB as against the iPhone’s 1304KB; again, this is an optimisation based on each device’s capacity. For a longer look at designing for very different screen sizes and phone capacities, take a look at Bryan Rieger’s Effective Design for Multiple Screen Sizes. Home Depot is a US retailer of home improvement, construction and appliances. The mcommerce site at m.homedepot.com uses location sharing to detect a customer’s nearest store, and then provides access to real-time store inventory and details on the aisle location of products in that store. 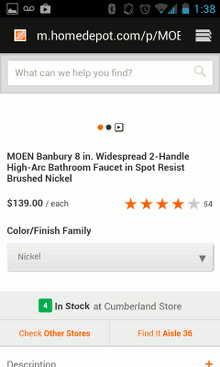 Home Depot’s m-commerce site allows you to see where in the store the products you’re interested in are located. This function would be incredibly useful if you’re already in-store and searching for something. 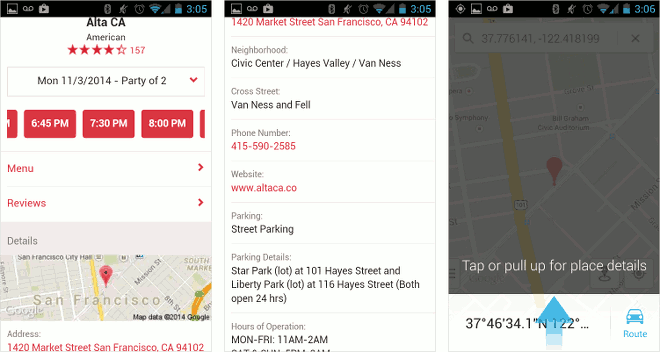 Customers can also reserve products to pick up later in their local store using their phone. The mobile redesign that made these features available doubled conversion rates and quadrupled mobile sales for the company. 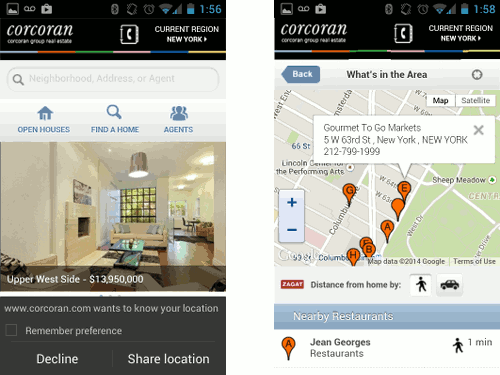 Corcoran is a New York real estate company whose website leverages location services to show potential home-buyers and renters amenities near to a house for sale or rent. It allows property hunters to share their location with its site, and will then bring up listings for the area around them, as well as information about schools, restaurants, markets, and so on. The Corcoran m-commerce site prompts you to share your location when you land on the homepage (left). It also shows amenities located near listings (right). The firm also runs hyperlocal mobile ads to encourage people to make use of real-time information. Matthew Shadbolt, Director of Interactive Product and Marketing for the firm, is quoted in Google’s Mobile Playbook (2nd edition) as saying: ‘If there’s a potential client on 23rd Street getting a coffee, we want to reach out to her to tell her that there’s an open house listing three blocks away that starts in 30 minutes. In New York’s hyper-competitive real estate market, an apartment can go on and off the market in 45 minutes. This means access to real-time information is crucial.’ Making use of real-time, local information in this way is unique to mobile’s mobility, and makes a good case for mobile specific optimisations. IHG encourages on-the-go local bookings through location services, serving up nearby hotels to customers based on GPS data from their phones. 60% of bookings on the company’s mobile channels occur within 48 hours of the hotel stay, indicating that a good percentage of its mobile site users are using the local information served up to them by the site to book a nearby hotel after they have arrived in a new town or city. 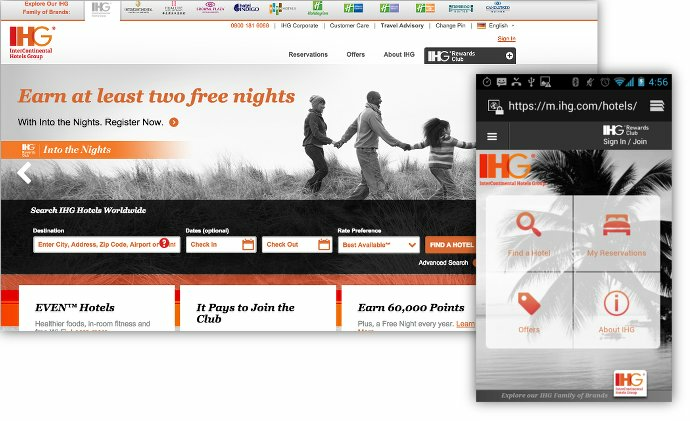 Compare the IHG homepage on desktop and mobile. The mcommerce site is action-oriented, with quick-links to find a hotel nearby, review your reservations, and view current offers. The desktop site gives space to offers that might promote customer loyalty, promote other hotels in the group (in this case the ‘Even’ chain of hotels) and advertise reward points. These are all valuable to IHG’s business, but the group has decided that mobile users are focused on quickly finding and reserving a hotel, and will be happier with a site that foregrounds these uses. IHG has been particularly clever in its implementation. For very low-end devices, it delivers a simple 24KB page containing a search form, doing away with everything peripheral, but still making its core business available to all users. Strategy: Dynamically served separate mobile site with device-detection, on different URLs opentable.com / m.opentable.com. 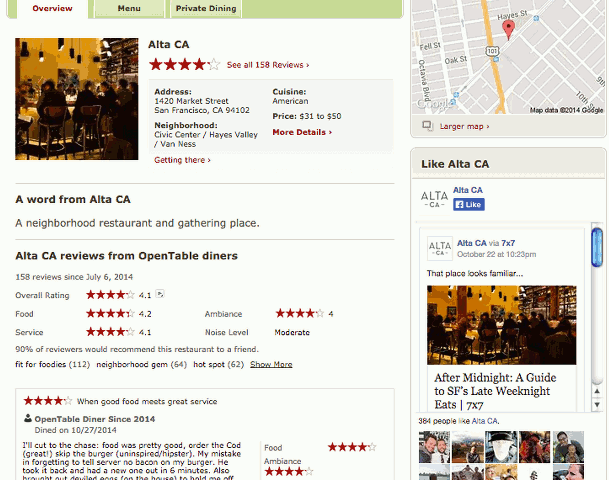 The Open Table mobile site at m.opentable.com foregrounds location and contact details on mobile, while the desktop site emphasises reviews and browsing. Where users will navigate to the desktop site to choose somewhere to eat, browsing reviews before making a choice, mobile users will be seeking actionable information: a phone number to call, a link to a Google map to work out directions to a restaurant from their location, parking information and nearby locations, and a quick and seamless reservation process. While all of this information is available on the desktop site, foregrounding different things on mobile again reflects different usage and user intention across different devices. Gucci launched a mobile website in December 2012 (m.gucci.com); since then, mobile conversions have increased by over 70%. FragranceNet built a mobile site when the company realised that a massive increase in mobile web traffic wasn’t seeing a similar increase in conversions. Touch friendly buttons and a made-for-mobile checkout flow with a reduced number of steps saw mobile sales increase by 48% within four months. RadioShack’s mobile site launch resulted in average mobile order value increasing by 30%; the company also reports that between 40 and 60% of people who use the store locator on their mobile website end up visiting a store. For Priceline, a mobile optimised site with simplified content, large buttons and a more streamlined checkout process saw average time on the mobile site increase by 45%, and the mobile site’s share of business grow by 31%. In this second part of our e-retailer m-commerce review, we took a look at content optimisations employed by large e-retailers. As in our first part, which looked at the effects of optimising performance on conversions, we found this time that there are many retailers that optimise content based on the user context, and there is much evidence to suggest that this too has a positive effect on conversions. In the next part, we’ll take a closer look at some individual site flows to assess the effect on user experience of various approaches.